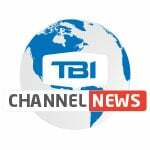 TBI's Emily Ball and Bryan Reynolds deliver January Channel News. TBI's Emily Ball and Bryan Reynolds deliver November Channel News. TBI's Emily Ball and Bryan Reynolds deliver October Channel News. Anchorman Bryan Reynolds, TBI's Director of Post Sales, delivers the September Channel News with a surprise guest.